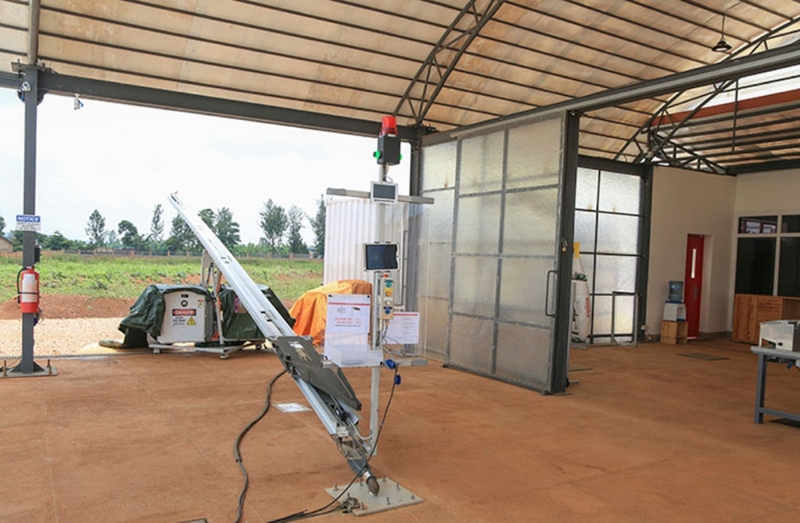 Inside Zipline’s New Rwandan Distribution Centre » UAV DACH e.V. The New Times was given exclusive access to the recently established Kayonza-based distribution centre of Zipline, which is already serving five hospitals in Eastern Province, supplying vital blood by unmanned aerial vehicles, commonly known as drones. This is the second such facility, after the one in Muhanga, to be set up by the firm in Rwanda. 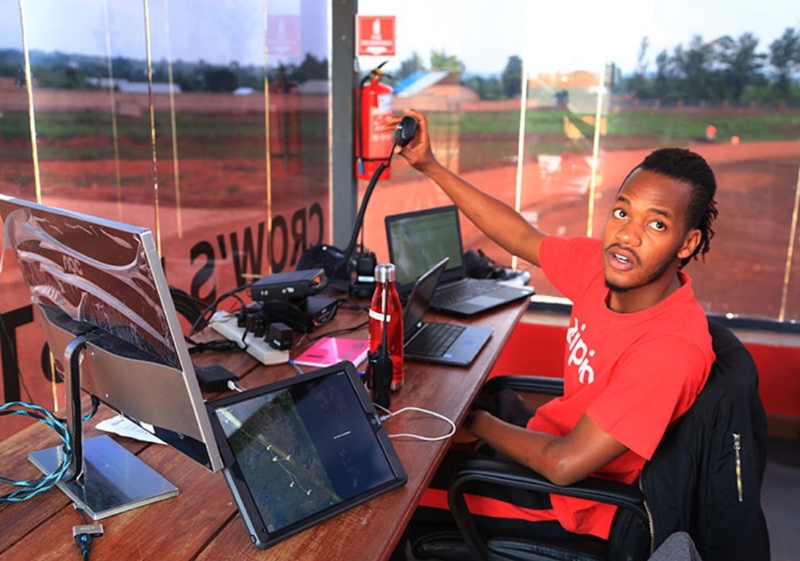 Renowned for its contribution towards reducing mortality and lifesaving threats, especially in remote Rwanda, Zipline’s new centre started full operations in January this year, making its first blood delivery on February 7, 2019. Inside the centre, there is a splendid view of three main operating rooms, a control tower where the movement of drones in the skies is monitored for safety reasons, and a warehouse where blood stocks are kept and then there is a flight operations centre. n just less than two months, the Kayonza distribution centre is serving five hospitals, which include Ngarama hospital, Gahini hospital, Rwinkwavu hospital, Kirehe hospital and Kibungo public hospital. With an all Rwandan technical team at the centre, over 300 deliveries of at least 550 units of blood have been successfully made. Together with Muhanga distribution centre, Zipline has to date made over 11,000 deliveries of more than 20,000 blood units. Thirty percent of them were emergency deliveries. Israel Bimpe, Head of National Implementation at Zipline, said that the Kayonza Distribution Centre has the capacity to make 150 deliveries per day. The firm has a fleet of more than 30 drones. “As a result, the Zipline staff have now grown to include over 40 Rwandans, consisting of pharmacists, biotechnologists, engineers, and a nurse,” he added. Michel Habiyaremye, the Director General of Rwinkwavu hospital, underscored the role of drone technology in ensuring quick delivery of blood, saying delivery time was slashed from 2 hours to just 15 minutes. By the end of the year, Zipline targets, to cover 100 health facilities including hospitals and health centres. The firm also plans to expand its portfolio of service to include the delivery of other medical products and vaccines. 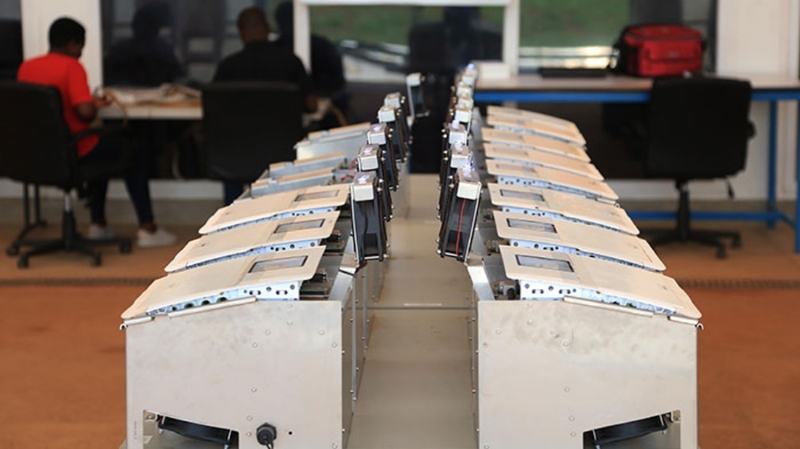 Unlike Muhanga, Kayonza is particularly a busy region when it comes to aerospace activity, which could be a challenge for the firm in terms of monitoring its drones. 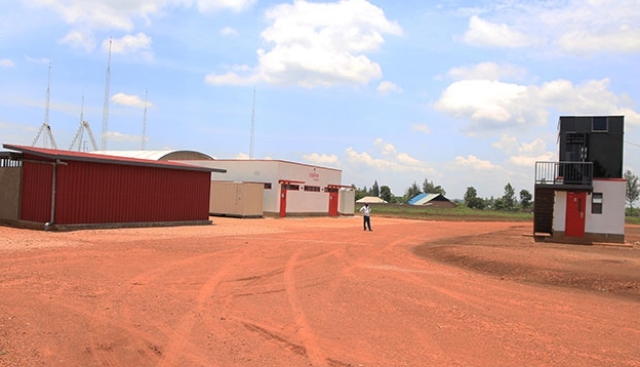 “We are in touch with the Rwanda Civil Aviation Authority because we understand Kayonza is one place where many aerospace activities take place, including Akagera aviation and military camps,” Benimana said. They are able to fly using Global Positioning System (GPS) without any pilots. In case of any technical issues, Zipline drones are designed to automatically detect any malefaction and safely return to the base for fixing. In the event of emergencies like severe weather, emergency requests from air traffic control or unplanned flight operation issues, each drone is equipped with a parachute that allows it to make immediate landing by slowly descending to the ground. 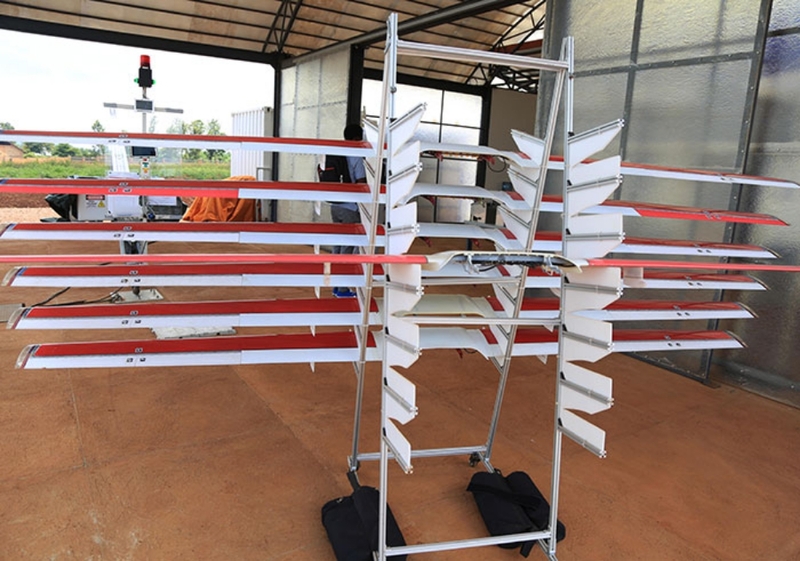 Zipline safely stores medical products provided by Rwanda Biomedical Centre (RBC) at its distribution centre, enabling immediate access to even the most sensitive or scarce items. Zipline packs the blood immediately from the ware house, each Zip can carry up to 1.8 kg; the Zips cruises at 100km/h, flying about 120 metres above the ground (so when it is flying around hilly Rwanda, it is “hugging” the terrain). When it is approaching a delivery site, it descends to 10-15 metres above ground where the package lands gently by parachute in a designated area the size of a few parking spaces. And the hospital staff is notified via text message. A delivery flight takes 15-45 minutes depending on the hospital’s location. 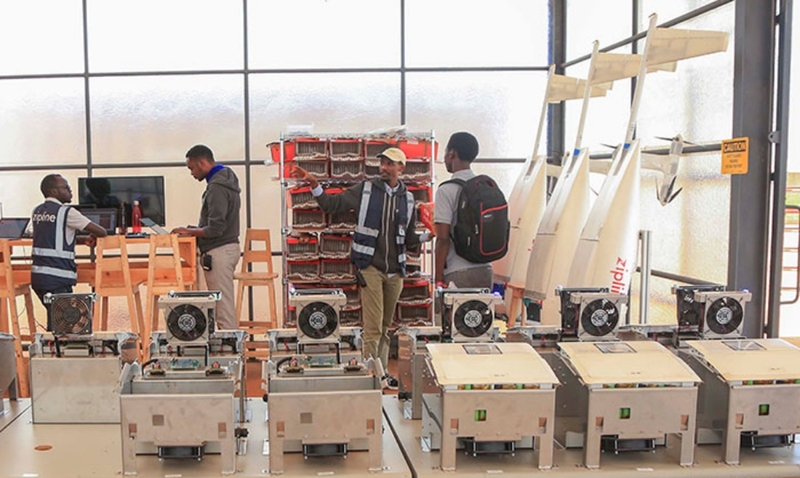 UAV DACH: Beitrag im Original auf https://www.uasvision.com/2019/03/21/inside-ziplines-new-rwandan-distribution-centre/, mit freundlicher Genehmigung von UAS Vision automatisch importiert. Der Beitrag gibt nicht unbedingt die Meinung oder Position des UAV DACH e.V. wieder. Das Original ist in englischer Sprache.